55 posts categorized "Posts by Jonathan"
We'll each take a part in telling our side of the surprise birthday story! There are so many behind-the-scenes arrangements to be made when attempting to put on a party, while keeping it from the mom of the house! We are grateful for all those who lended a hand and prayed for us, and we missed those of you who could not attend. "Wow! What a great day. Aunt Bet and I were on our way back down to South Carolina on Saturday since Deb didn't have power at her house after the big storm when Jonathan called and said the power was on again! I was so glad to hear that. So Bet and I turned around and headed to Deb's. That way we could be there the next evening to see the surprised look on her face! It was good to see so many of her friends. I'm thankful to be part of her past, present, and future." "My job in the great surprise birthday caper was to occupy the birthday girl while the rest of the family made final preparations for the big reveal! Easy, right? I begged for an afternoon visit to the Verona Antique Mall--not much persuading was necessary when I mentioned my request to Deb. We got to the mall, wandered several aisles, and I realized that time was fleeting. My job was to get Deb back to the house by 4:45. Amazing how fast time flies in an antique mall! She couldn't understand why I was ready to go. I used the "I'm overwhelmed by all these antiques and choices" excuse. But she kept wanting to visit one more booth in the mall until finally I persuaded her we really needed to go. While I was making a little purchase (another potato masher for Granny! ), Deb went to cool the car. I made a quick phone call to Hannah letting her know we were on the way home. Driving up the driveway, Deb began to suspect something was up. "Who are all those people and what are they doing?" The gang had gathered at the top of the driveway to welcome the birthday girl home. Her mouth dropped and she started pointing out various people, hardly believing they were all there to celebrate her birthday. What fun! We finally surprised the person in the family who is least likely to be surprised by anything!" "Before Mom and Aunt Bet got back from the antique mall, I went out to retrieve the Leaning Tower of Pizzas. On the way home, I saw Dad's truck pull onto the road ahead of me! Yay! He was able to make it back from working the storm for a little while. He was there to surprise Mom when she drove up and stayed for a quick chat before he had to return to work. We were so glad that God answered our prayers that he would be able to be part of the celebration! We thank the Lord for His providential sovereignty in giving us a godly mother and for His grace in allowing the party to come together despite the chaotic weekend!" "Hannah and I had a ton of fun planning the decorations and how everything would be set up! Taking inventory of our party supplies, we found blue and red plates, flag napkins, and plastic utensils. On our way back from market last week, we were able to quickly stop by the dollar store and pick up some balloons, streamers, tablecloths, cups, and star confetti for the tables. Hannah cut out red, white, and blue paper triangles for a bunting, made some paper pinwheels, and snuck out early Sunday morning to pick fresh flowers for a couple of simple, beautiful arrangements. As we were planning out what the menu would be, we knew it would have to be something easily prepared and stored secretly. The pizza would be taken care of with Jonathan running out to pick it up while Mom was away. Vegetables and dip would work too, but we had to buy extra veggies to supplement what was in the fridge. Not wanting Mom to wonder where they came from, we stored everything in a cooler in an upstairs room. :) It was convenient that we were bringing vegetables for snacks at church and could at least prepare some without arousing suspicion. For dessert, I made chocolate cupcakes and homemade peach ice cream. Finding the time to bake 90 cupcakes was a little tricky, but thankfully Aunt Bet, Granny and Mom went out shopping on Friday, and I was able to rush around in a tizzy baking them. Since it was my market baking day anyway, all my ingredients and supplies were ready to go. The quadruple batch of peach ice cream had to be frozen in the ice cream freezer in 2 installments, AFTER Mom had left, so it was a bit of a mad rush to get it done in time. Aunt Bet brought some huge, fresh picked South Carolina peaches just for the ice cream, and they were so delicious." "Guests came from near and far away to join us for this special event. Mom was excited to talk with many dear friends who were present. It was soon time for the pizza party to begin! Everyone enjoyed gathering in the shade behind our house to escape the evening's sun. Families scattered around the yard and porch munching and fellowshipping. Perfect spot for a picnic! The sweet W. family were all dressed patriotic for the occasion. It was a great opportunity for some to renew acquaintances and make new friends. Mom has always wanted to invite people for a hymn sing, but plans for one have been put on hold...until now! She never suspected that her desire would actually come to pass as a special birthday surprise. After we finished up Sarah's delicious ice cream, we gathered the chairs and hymn books and sang for awhile into the evening. Several people requested favorite hymns, and we even had a few budding musicians playing along on some numbers with banjo and guitar. Joining our voices together in song to God was a wonderful end to the evening." "Oh my! I couldn’t believe this gift when I opened it! It’s beautiful! My friend, Chris, made this creative and colorful quilt using the Scrappy Spools quilt pattern, and I absolutely love it! What a special remembrance of this special day! Thank you, Chris! All around this was a wonderfully surprising day--I think I like surprises after all! I’ve been so blessed and honored by everyone who came—some traveling from across town and others traveling up to three hours to get here! I am amazed and humbled! Your presence was the very best gift of all! Thank you so very much! And I'd like to thank all my friends and family for the emails, phone calls, birthday cards, gifts, and well-wishes you sent my way. I don't think I'll ever forget my 60th!" Making a Beeline to Apiculture! All right, so just to set the record straight, the girls haven't been the only busy bees here in the Girotti household. :) I've been up to some interesting projects as well--namely beekeeping! A good friend of mine, Matt, who has wanted to do beekeeping for several years suggested we take on the project as a joint venture. So this past January we bought hive plans, pine boards, glass windows, screws, and 30,000 members of the species Apis mellifera! After several furious weeks of cutting twice and measuring once....oh wait--scratch that, reverse it...we completed the hives, paint and all, and set them up in preparation for our new guests. We put two of our hives here at the Girotti house, including the one above in a nice gladed spot in our woods. After all, we have to make our bees feel at home! :) The third hive was placed at Matt's friends' house. Last week, we picked up our bees! Bees come in 3-pound (10,000 bees!) packages, each with its own queen. Now, the queen is sequestered in a small cage called, appropriately enough, the queen cage. The queen cage is plugged with a candy-like substance and a cork. This will come into play later in the story. Matt and I suited up with light-colored clothing and veils. Then with packages in hand, and armed with a supply of sugar water, we trekked down the hill to the first hive, followed closely by the journalistic team. With trepidation we set the package on the ground next to the hive and planned our next step. First, calm the bees. Solution: spray them with sugar water. Matt and I are planning on a little more natural, wholesome approach to beekeeping, including not overloading the bees on processed sugar; however, scruples were overcome this first time. With a fine mist of sweetness inside the box, the bees instantly calmed down and their buzzing was silenced. It was determined that I would take the metal feeder can out of the package box and Matt would grab the queen cage. On the count of three, we executed the plan with precision! I replaced the feeder can to ensure no bees got out while Matt examined the queen cage. DISASTER! Much to our chagrin, instead of a perky queen bee ready and waiting to lay thousands of eggs into honeycomb, we saw a lone, shriveled, very dead-looking queen. This was not, one might say, the bees' knees. Consolation came, however, when we called up the bee supply store and were informed that they would replace the queen, free-of-charge. Whew! It was decided that we would install the other two packages, then head back over to the bee store and use the replacement queen on the third hive at Matt's friends' house. Take number two: now with our movements honed with practice, combined with our latent beekeeping skill, the second hive went a lot smoother! This time the queen was alive! Remember that candy plug and cork I mentioned awhile back? We removed the cork so the candy plug was exposed. This allows the bees to access the plug and eat through it to reach the queen. In the process of eating the plug, they familiarize themselves with the queen's pheromones and accept her as the leader of the hive. So we hung the queen cage on the top bars and readied for the big event. Again, I took the feeder container out to expose the swarming, buzzing colony inside. Matt took the box and gave several vigorous shakes. Quicker than you can say, "Raw local additive-free honey!" the bees poured out of the package and into our hive! It was amazing to see the bees' natural, created instincts take over. Immediately, they must have sensed they were in their new home, because several bees climbed out of the entrance and started fanning. This is when they turn their bodies around and use their wings in order to circulate the pheromone that says, "Hey everybody, come on in!" And come in they did. We checked back about 15 minutes later, and nearly all the bees that had been left in the box had flown out and joined their comrades inside the hive. We finished the evening out with the next two hives, everything going very smoothly, and only one sting between the two of us! We look forward to this new adventure and pray that God will bless our...that is, to say, the BEES...efforts. This will be a great way to learn more about His creation as well as help out Virginia pollinator population and have a lot of great-tasting honey!! Stay tuned this spring and summer as the hives and honey grow! First, I built the basic box frame. The dimensions were dictated by the size of the glass window I had purchased, in this case an 18 1/16" x 32 3/16" basement storm window. But, I had to take into account that the glass will be at angle, preferably in the 30-45 degree range. Due to my window size, I had mine at about 23 degrees, because at 30 or 45 degrees, the frame would be prohibitively narrow. The final dimensions were 16 9/16" x 32 3/16". I used 1 1/4" wood screws at the corner joints, which made a much sturdier frame than the nails I used in my first attempt. The other week Dad, Hannah, and I were fishing out at Braley Pond (emphasis on fishing not catching!). While Hannah and I were walking along the trail that circles the pond, I looked down and saw this three foot copperhead in the middle of the path. I was about a stride or so from stepping right on top of it and Hannah, who was walking ahead of me, must have stepped over it without seeing it! We are so thankful for the Lord's gracious protection! How Hannah did not get bitten was nothing short of miraculous. I got a long branch and and swept the copperhead off the trail and down the hill toward the pond. Needless to say, we were very watchful of our steps after that! the young lion and the serpent you will trample underfoot." We thank God for the special care and provision He gives to His children! Here's a new hymn we're learning taken from the 1854 Southern Harmony hymn collection. The tune name is called Dunlap's Creek and is named after Dunlap's Creek Presbyterian Church which is near where the tune originated. What empty things are all the skies, and this inferior clod! There's nothing here deserves my joys, there's nothing like my God. 'Tis thy sweet beams create my noon; if Thou withdraw 'tis night. If my Redeemer shows his head, 'Tis morning with my soul. For thou shalt eat the labour of thine hands: happy shalt thou be, and it shall be well with thee. Thy wife shall be as a fruitful vine by the sides of thine house: thy children like olive plants round about thy table. Behold, that thus shall the man be blessed that feareth the Lord. The Lord shall bless thee out of Zion: and thou shalt see the good of Jerusalem all the days of thy life. Yea, thou shalt see thy children's children, and peace upon Israel. Happy 30th Anniversary, Dad and Mom! We love you so much - thanks for being such a godly example of marriage for us! Your faithfulness to each other is a wonderful picture of the love Christ has for the church. God's grace has been evident in your lives as you have sought Him during the past 30 years in your marriage and in being our parents. We love being your children! Last weekend we had the opportunity to attend the fourth annual Family Encouragement Weekend. It was started by the Wilkes family whom we had met a few months ago at a hymn sing in Northern Virginia. One of the chronic disappointments my family has is the small number of like-minded godly families in our area so we were thrilled to see the invitation to the "FEW." Contrary to the conference's acronym, there were about 200 people in attendance--quite the crowd! It was great to meet so many different families from Virginia, West Virginia, Maryland, North Carolina, and Georgia. Before we began on Friday night, we sang a lot of hymns, led by the homeschooled orchestra! Both on Friday night and all Saturday, there were several different speakers, including an overview by Mr. Wilkes, "Family Oneness" by Mr. Hynes and "From Completeness to Maturity" by Mr. Neely. It was encouraging to taste this spiritual food. I think it is great for even godly, committed Christians to hear continual exhortation toward spiritual maturity and growth. Personally, I know it is easy for me to lapse into Christian Autopilot Mode and not actively seek Christ more. In addition to spiritual food, there was physical food as well! The doctrine of cookies was well expounded upon, to the edification of all. There were also multiple times throughout the weekend in which families were arranged in 3 or 4-household groups for mutual prayer. Family members prayed for each other, families prayed for other families, and everyone prayed for those in authority over us, especially our federal government. 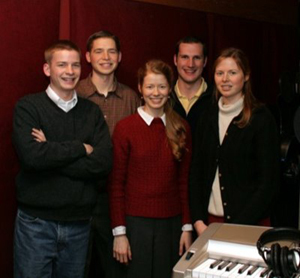 These were great times; Mr. Wilkes shared, "This is the best part of the Family Encouragement Weekend." What could be better than preaching of the Word, prayer, singing, and fellowship with like-minded believers? Happy 28th anniversary to our parents! They have been a wonderful, godly example to us in their marriage. We love you, Dad and Mom! Today, May 19th, is the official release date of 2 brand new audio recordings by the talented GenevanSong singers. They are excited about praising the Lord in song and teaching others to do the same! If you are interested in learning to sing hymns or Psalms in four-part harmony, these CDs would be wonderful for giving practical help towards that goal, as it includes instructional vocal tracks along with the final version (we're not aware of other similar Psalm/hymn Cds that do this). Click here to view a photo report of their recording process, and continue reading to find out about our special giveaway! 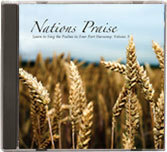 Nations Praise seeks to teach families and churches how to sing the Psalms in four part harmony. The first ten tracks demonstrate the full harmony versions. The following selections break the parts down to soprano, alto, tenor, and bass, so you can learn your notes and sing along. All selections can be found in The Book of Psalms for Singing. Jonathan: I have lamented before on this blog about the lack of quality music that conforms to the principles in God's Word. I am especially pleased, therefore, to see what the Lord is doing through GenevanSong. Not only do these CDs exemplify godly, joyful singing, they also invite families and churches to do likewise. The other day, Hannah told me that the Servens had asked us to review their two newest CDs. I was certainly willing to do so. On Saturday, I had to run some errands around town, so I took Nations Praise with me in the car to listen to. It was great! The sound quality was professional, and the harmonies were well sung and blended beautifully. My only wish was that it could have lasted longer! I would say my favorite tracks were The Lord is My Shepherd (based, of course on Psalm 23) and By Babel's Streams We Sat and Wept (taken from Psalm 137). By Babel's Streams sounded like it had an Appalachian flavor to it, which I especially enjoyed. Once I finished all 10 Full Harmony tracks, I decided to put GenevanSong's idea to the test. Was it possible to easily learn a part? I chose The Lord is My Shepherd to tackle first. I sing bass, so it took me awhile to skip to track 43 on our car's CD player. Nathan Serven's clear voice started singing, and it was only a few minutes later that I was able to start joining in. The bass part was fairly simple, so I was able to get the first couple phrases down quickly. A few more miles down the road and I had the rest of the part under my belt. So far, so good. My next step was to skip all the way back down to track 3 to the full harmony and try singing along with that. I did so--and failed miserably. I completely forgot my part as soon as I heard all the different harmonies together. Back to 43. I listened and sang some more. Back to 3. This time it was a little better. More back-and-forth track skipping ensued. I was gradually able to sing along, each time gaining more ease. I was stuck on one phrase though: ("....green pastures He leadeth me..."). I could nail it every time when singing bass solo, but it wouldn't come with the full harmony. Finally, when pulling up in our driveway, I was able to get it! Once inside, I demonstrated to the rest of the family, and they all agreed it sounded great. So yes, it does work! Within an hour, I was able to learn a part and sing it along with others, by God's grace. Now for some of you, you might require more grace, but nonetheless, it wasn't that difficult. I am definitely not a trained singer, so I usually am not able to know what notes to sing by merely looking at the notes in the hymnal. Hearing the individual parts by themselves helped a lot. I trust it will help you, too. My next song to learn will probably be either By Babel's Streams or Come Thou Fount from Glory Laud and Honor (see below). I would heartily recommend the GenevanSong CD's for both musical enjoyment and musical instruction. Keep up the good work, GenevanSong! 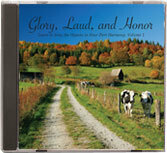 Glory, Laud, and Honor seeks to teach families and churches how to sing the Hymns in four part harmony. The first ten tracks demonstrate the full harmony versions. The following selections break the parts down to soprano, alto, tenor, and bass, so you can learn your notes and sing along. All selections can be found in The Trinity Hymnal, and many other fine hymnals. Hannah: Don't you like the cover photos of these CDs? I was impressed with the quality of the overall design, and after having enjoyed the first 2 volumes of the Servens' Psalms CDs, I was even more pleased with the way the sound turned out on these new volumes. I thought a nice mix of common/unfamiliar hymns were included on Glory, Laud, and Honor. One of my favorites was By Grace I'm Saved. Listen to a sample clip of Crown Him With Many Crowns here. I'm looking forward to possibly learning some of these selections with the family and eventually, church family! To celebrate the release of these new recordings, Mountain Musings is hosting a CD giveaway, compliments of the Serven Clan! The winner will receive a free copy of each of the new CDs: Nations Praise and Glory, Laud, and Honor. To enter for a chance to win this drawing, make a comment to this post telling one of your favorite Psalms or hymns. This contest will end on Thursday, May 22nd at 9:00 pmEST, and the results will posted on Friday.